Father Gerald Blessing, pastor of St. Paul Parish in St. Paul, showed off the renovations of the church to visitors. The three-month project included painting, flooring, renovation of pews and more. Jennifer Brinker is a reporter for the St. Louis Review and Catholic St. Louis. Geographic areas covered: Parishes and schools in the North City, North County, West County and St. Charles Deaneries. Jenny Wehde never imagined that the dishes she keeps in her china cabinet would become part of the inspiration for the newly renovated St. Paul Church in St. Paul. 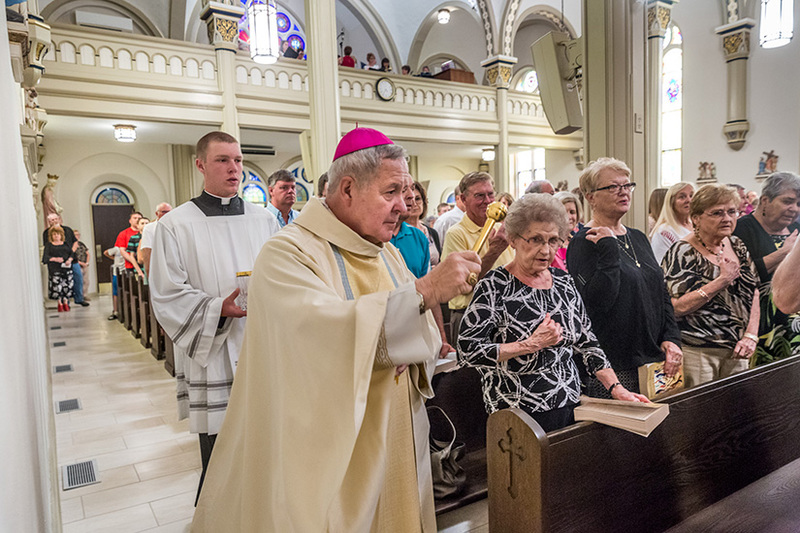 Archbishop Robert J. Carlson joined parishioners June 2 for Mass and blessing of the church. The project also included a new mural on the domed ceiling of the sanctuary depicting the Ascension, other repainting and replastering of the 121-year-old church building, restoration and lighting of the Last Supper scene on the front of the altar, restaining and restoration of the pews, new flooring, sound system and heating and air conditioning. Pastor Father Gerald Blessing, noted that the project was paid for entirely from parish reserves. He cited the generosity of parishioners who contributed to the effort. “While all of this is going on, we also had our parish auction, which was our most successful auction ever,” he said. 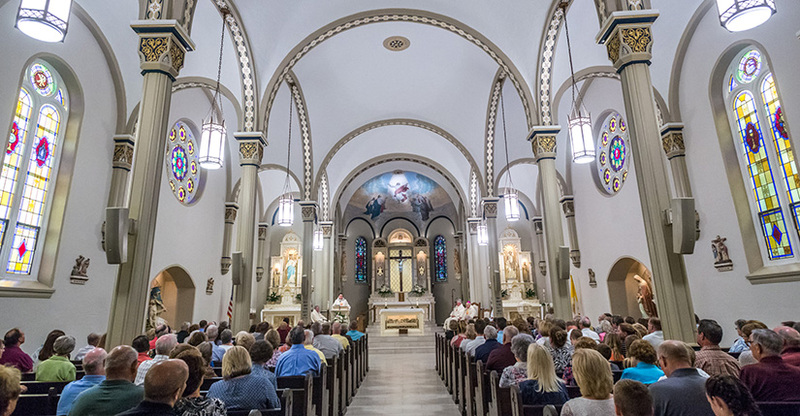 St. Paul Church in St. Paul recently had an extensive interior renovation with what is called a “classic, timeless look.” Archbishop Robert J. Carlson visited the parish to celebrate Mass on June 2. In the homily, the archbishop reflected on the feast of Corpus Christi, linking the parishioners’ hard work to their understanding of the Real Presence of the Eucharist. “If our Lord wasn’t here, why would you have spent all that time, and energy and resources to remodel this beautiful church?” Archbishop Carlson asked. St. Paul Parish’s church in St. Paul has recently undergone an extensive interior renovation, including a mural on the sanctuary ceiling. Archbishop Robert J. Carlson blessed parishioners during his visit to the parish on June 2. The parish also recently renovated the parish picnic grounds and reconfigured the cemetery to open up about 1,000 new plots. St. Paul, which marked its 169th anniversary this year, was begun by German immigrant families who built a log building on 40 acres of land in what was known as Dog Prairie, according to research from parishioner Judy Sigmund, author of “Dog Prairie Tales.” Families laid the cornerstone for the church in 1849, which was considered the beginning of the parish. Until then, the residents were registered at nearby St. Peter in St. Charles. By 1854, a 40-foot by 80-foot limestone church was completed. As the parish began to grow, the church was torn down in 1896, with much of the rock used for the concrete foundation of the new church. Parishioners hauled 500 wagon loads of sand, 37,000 bricks and other materials to the site. The American Gothic Revival building of buff colored brick and a slate roof was completed a year later. Today, the parish has 789 registered households. Most families have been here for generations. Longtime parishioner Larry Mueller is one of seven siblings who were raised at St. Paul. “They all live in this area and go to church here,” he said. It’s even hooked the attention of visitors. Bill and Pat Logue, full-time travelers who were staying at a nearby RV park, stumbled upon Mass June 2 with no idea that the church was celebrating its makeover with a blessing from the archbishop.